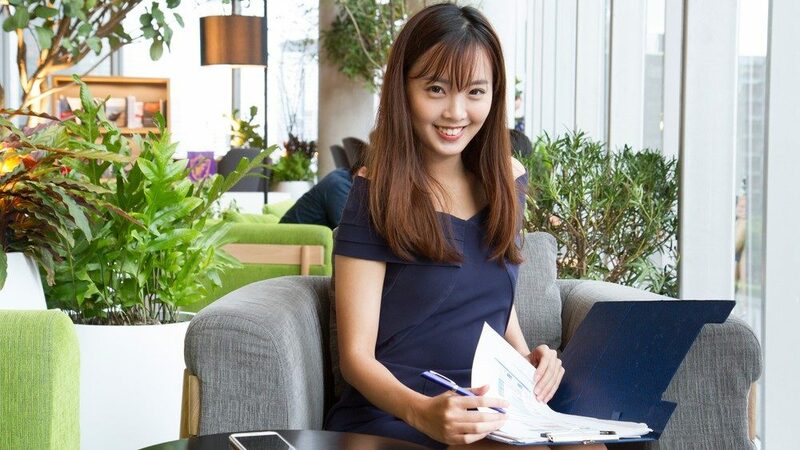 This article is intended as a simple guide to tenancy agreements, and is written for landlords who wish to rent out their property in Malaysia. 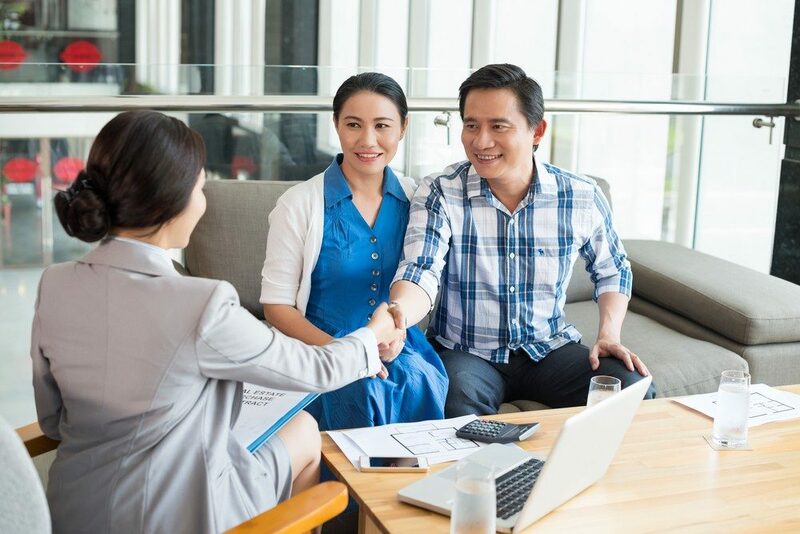 It covers tenancy agreements in Malaysia; what they are, why you need it as a landlord, the tenancy process, deposit amounts, and simple tenancy agreement sample as reference. Want to rent out your property in Malaysia? Even though the profit from rental property has dropped over the years (a landed house will fetch 2.5% rental yield today vs 5% a decade ago), it’s a tried and tested way to generate income while owning an appreciating asset. There are hidden costs, too, especially if you run into problems with your tenant. If you don’t have a tenancy contract drawn up between you and the tenant, it will be harder resolve any disputes. A prolonged dispute can quickly cancel out any profits that you have gained from the rental income. That’s why, to protect both the landlord and the tenant’s welfare, a clearly-worded tenancy agreement is important. But, hiring a lawyer to draft a tenancy agreement can be expensive. So, many people choose to draft their own agreement and ask the other party to agree to it. Until the Residential Rent Act (see side note) comes into effect, the tenancy agreement is the only document that protects the rights of the landlord and the tenants. To protect the interests of both landlords and tenants in a fair way, the recent Malaysia Budget 2018 proposed a “Residential Rent Act” to establish a more robust rental law in Malaysia. At the moment, there is no such Act in place, so the most important thing is to have a clear tenancy agreement. There are many details to cover. And the details have to be worded so that there is minimal room for misunderstanding. When is the tenancy agreement signed? The landlord and tenant will sign the tenancy agreement when the security deposit is paid. After you have renovated your property (and optionally furnished it), you can put it on the rental market, or engage a property agent to help you. Your rental property can also be added to many rental listing websites in Malaysia, including iProperty, PropertyGuru, Wonderlist, and Speedrent. Within 7 days, the tenancy agreement needs to be signed by both parties. The tenant will also pay a security deposit and utility deposit. Finally, the signed tenancy agreement is stamped, and becomes an official legal document. 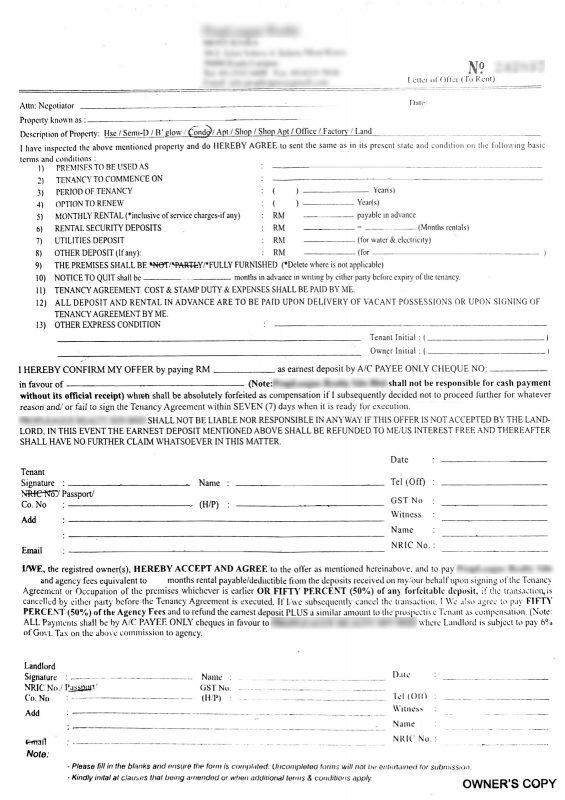 Above: Copy of tenant’s letter of offer to rent a property from the landlord. This letter is given from the tenant to the landlord before the actual tenancy agreement in Malaysia is signed (click to enlarge). How many deposits are needed in a rental agreement? Earnest deposit: The first deposit is the earnest deposit. It is basically a booking deposit, or a deposit to “reserve” the property so that the landlord will not rent the property to anyone else for the next 7 days. The amount is equivalent to the first month’s rent. It can be kept in escrow by the property agent. When the tenancy starts, the earnest deposit is usually considered the first month’s rent. Or, it can be used as the security deposit, or it can even be returned to the tenant. Security deposit: The security deposit is collected to protect the landlord in case the tenants violate the terms of the tenancy. The amount is usually equivalent to two month’s rent. It can be used to pay for damages, cleaning, keycard replacements, or even be forfeited entirely if the tenant leaves before the tenancy has ended. But if there are no problems by the end of the tenancy, the full amount is returned to the tenant. Utility deposit: The utility deposit is paid to cover any outstanding utility bills at the end of the tenancy, such as gas, electricity and water. The amount is usually equivalent to half a month’s rent. However, it is not a valid legal document (ie. admissible in court) until it is stamped by Lembaga Hasil Dalam Negeri Malaysia (LHDN) or Malaysia Inland Revenue Authority. 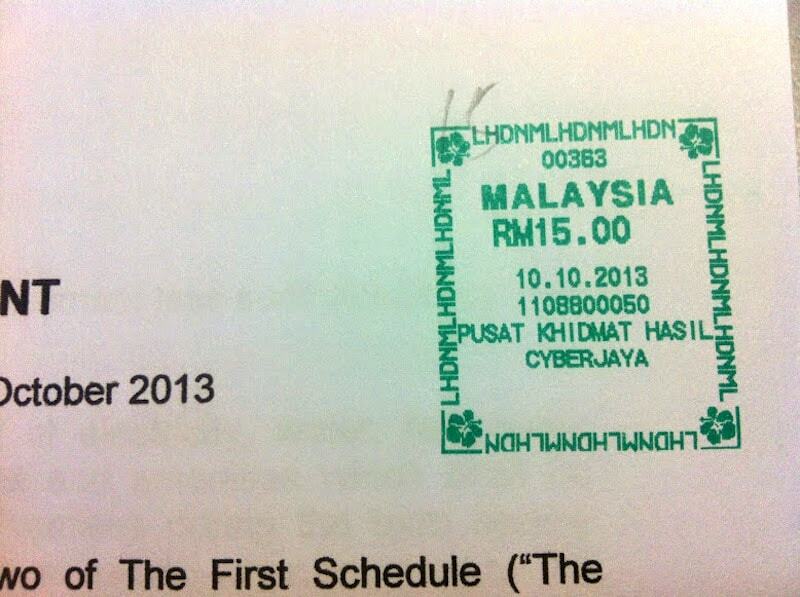 You can bring the agreement to your nearest LHDN office to get it stamped. There will be a charge for this, known as the stamp duty. Stamp duty = RM1 for every RM250 of the annual rental in excess of RM2,400. That means, if the annual rental is below RM2,400, the stamp duty is free. Stamp duty = RM2 for every RM250 of the annual rental in excess of RM2,400. That means, if the annual rental is below RM2,400, the stamp duty is free. It is advisable to get original copies stamped for each party. That means one for the landlord, one for the tenant, and one for the agent (if applicable). Tenancy agreements, like any other legal document, are carefully worded by lawyers to make sure that there is minimal room for misinterpretation. Below we provide a simple breakdown of the common clauses found in a tenancy agreement. The cover page includes the date of the agreement, and the names and IC number of the parties involved. The next part of the document establishes some definitions, including the “landlord”, “tenant”, and “demised premises”. To make the paperwork easier, the first part of the agreement does not contain any actual details of the property, contact details, rental amounts, etc. It simply refers to a separate section known as the “Schedule” and the “Inventory”. All the actual information is entered in the Schedule. And the party whose name and description are stated in Section 3 of the Schedule hereto (hereinafter called the “Tenant”) of the other part. WHEREAS the Landlord is the legal and beneficial owner of the demised unit described in Section 4 of the Schedule hereto (hereinafter referred to as the “Demised Premises”). AND WHEREAS the Landlord is desirous of letting and the Tenant is desirous of taking the Demised Premises together with furnishings, fixtures, fittings and furniture as described in the Inventory hereto (on an “as is basis”) and upon the terms and conditions hereinafter contained. The next three clauses specify the tenancy start and end date, rental amounts as well as the security deposit and utility deposit. Again, all the actual deposit amounts are included in the “Schedule” section later on. The Landlord hereby lets and the Tenant hereby takes a tenancy of the Demised Premises together with the use and enjoyment of the common facilities used in conjunction with the Demised Premises TO BE HELD by the Tenant for the term of tenancy specified in Section 5 of the Schedule hereto (hereinafter referred to as the “Term of Tenancy”) from the date specified in Section 6.1 of the Schedule hereto (hereinafter referred to as the “Commencement Date”) to the date specified in Section 6 of the Schedule hereto (hereinafter referred to as the “Expiry Date”) at an agreed monthly rental specified Section 7 of the Schedule hereto (hereinafter referred to as the “Reserved Rent”) payable in advance by the date of each and subsequent calendar month specified in Section 8 of the Schedule hereto and subject to the terms and conditions hereinafter contained. The next section covers the responsibilities and obligations of the tenant. We have added yellow highlighted text to explain what each clause means in simpler terms. 4.1 To pay the Reserved Rent on the days and in the manner aforesaid. 4.2 To pay all charges in respect of water, electricity, and gas consumed on the Demised Premises including sewerage charges and all other utilities supplied to the Demised Premises according to the meters thereon and all charges for telephone (if any). 4.3 During the Term of Tenancy, to keep the Demised Premises, the furniture, fixtures and fittings listed in the Inventory hereto (if any) together with any additions thereto in a good and tenantable repair and condition (normal wear and tear accepted). 4.4 To use the Demised Premises as a place of residence in the occupation of one family only. 4.5 To observe all the house rules and regulations made by the Management of the complex (if any). 4.6 Not to carry on or permit or suffer the use of the Demised Premises for any other purpose and in particular not to use the Demised Premises for any unlawful or immoral purposes. 4.7 Not to suffer or permit anything to be in or upon the Demised Premises or any part thereof which may or is likely to be a nuisance, annoyance or danger to the owners and/or occupiers of adjacent and/or nearby units and premises and to indemnify the Landlord in respect of any claims arising there from. 4.8 At all times, to keep and maintain the interior thereof including all doors, windows, glass, shutters, locks and fastenings and other furniture fixtures fittings and additions thereto in good and tenantable repair and decorative condition and to replace and substitute the electric/fluorescent bulbs and all repairs and maintenance below RM150 at its own costs during the Term of Tenancy. 4.9 Not to make or permit any alteration in the construction or structure of the Demised Premises nor to cut, alter or injure any of the walls, timbers or floors of the Demised Premises nor to hack any holes or drive anything whatsoever into the walls or to bore any holes into the ceiling without the previous written consent of the Landlord and if the teak timber finish of the floor (if any) is scratched and/or damaged, to varnish and restore the same to its original condition upon termination of this Agreement. 4.10 Forthwith to give the Landlord notice in writing of any structural defects in the Demised Premises. 4.11 To replace at the expiration or sooner determination of the Term of Tenancy such of the Landlord’s furniture, fixtures and fittings and other property within the Demised Premises, as may have become damaged or lost by direct substitution i.e. of equivalent value and quality. 4.12 Save in so far as the Landlord is made liable therefore by statute not to hold the Landlord liable for any accident damage or injury caused to the Tenant, his servants, agents, licensees and invitees on the Demised Premises which may happen as a result of the negligence improper management, breakage or want of repair of any part of the Demised Premises or any fittings, fixtures furniture and/or equipment therein and to indemnify the Landlord for all damages arising therefrom. 4.13 To permit the Landlord and his duly authorised representatives upon giving seven (7) days previous notice in writing at all reasonable times to enter upon and examine the condition of the Demised Premises, whereupon the Landlord shall be entitled to serve upon the Tenant a notice in writing specifying therein any repairs necessary to be carried out and requiring the Tenant to forthwith to execute the same and if the Tenant shall not within fourteen (14) days after service of such notice proceed diligently with the execution of such repairs or works then the Landlord with or without workmen and others shall be entitled to enter upon the Demised Premises and execute the repairs and the Tenant agrees that the costs thereof shall be a debt due from the Tenant to the Landlord and be forthwith recoverable by action. 4.14 Not at any time during the Term of Tenancy without the consent in writing of the Landlord to assign, sub-let or otherwise part with the possession of the Demised Premises or any part thereof or permit of suffer any other person or persons to hold or occupy the same or any part thereof. 4.15 Not to do or permit to be done on the Demised Premises anything which may or will infringe any of the laws, bye-laws or regulations made by the Government or any competent authority affecting the Demised Premises or whereby the policy or policies of insurance against loss or damage by fire may become void or voidable or whereby the rate or rates of premium payable thereon may be increased and to repay the Landlord all sums paid by way of an increased premium. 4.16 To maintain and service all the air-conditioning units (if any) within the Demised Premises as and when necessary during the Term of Tenancy at the Tenant’s own costs. Provided always nothing herein shall make it incumbent on the Tenant to compensate for any major replacement or extensive repairs to the air-conditioning units save and except where replacement or repairs are caused by the negligence of or misuse by the Tenant, its servants and/or agents or through lack of maintenance. Tenant to service the air-conditional during the tenure period every once a year. 4.17 To insure his own valuables and belongings including all additional furnishings fixtures and fittings brought thereon the Demised Premises against loss and damage by fire or theft during the Term of Tenancy. 4.18 At the expiration or sooner determination of the Term of Tenancy hereby created to peaceably and quietly yield up the Demised Premises to the Landlord with all the furniture, fixtures and fittings (except the Tenant’s fixtures and fittings) therein in tenantable repair in accordance with the Tenant’s covenants herein before contained. 4.19 During four (4) clear weeks immediately preceding the termination of the tenancy unless the Tenant shall have given notice of his intention to renew the tenancy as hereinafter provided, to permit persons with the written authority from the Landlord at all reasonable times of the day to view the Demised Premises for the purpose of letting the same. 5.1 To pay the Quit Rent assessment, service charges and other outgoing relating to the Demised Premises other than those herein agreed to be paid by the Tenant. 5.2 To insure and keep insured the Demised Premises, furnishings, fixtures and fittings belonging to the Landlord against loss and damage by fire during the Term of Tenancy. 5.3 Upon the Tenant paying the rent hereby reserved and observing and performing the covenants, obligations and stipulations herein on his part contained, to allow the Tenant to peaceably hold and enjoy the Demised Premises without any interruption from the Landlord or any persons rightfully claiming through under or in trust for him. 5.4 To ensure that all the electrical appliances supplied as listed in the Inventory are in good working order at the Commencement Date of this Agreement. The next part defines what happens in the case of exceptions. We have added a side column to explain what each clause means in simpler terms. 6.1 If at any time the rent or any part thereof (whether formally demanded or not) shall remain unpaid or unsatisfied for seven (7) days after becoming payable or if any of the Tenant’s covenants shall not be performed or observed or if the Tenant shall suffer execution on the Demised Premises or if the Tenant shall become a bankrupt or being a company or corporation shall go into liquidation otherwise than for the purpose of amalgamation or reconstruction or if the Tenant for the time being shall enter into any composition with the Tenant’s creditors or suffer any distress or execution to be levied on the Tenant’s goods then and in any of those events it shall be lawful for the Landlord or any persons authorised by the Landlord in that behalf at any time thereafter to re-enter upon the Demised Premises or any part thereof in the name of the whole and thereupon this tenancy shall absolutely determine but without prejudice to any right of action or remedy of the Landlord in respect of any breach of the Tenant’s covenants herein contained. Landlord can enter the property if tenant has not paid rent for more than 7 days, or became bankrupt. 6.2 If the Demised Premises or any part thereof at any time during the Term of Tenancy be destroyed or damaged by any cause (other than the act or default of the Tenant or any servant of the Tenant or any person who is in the Demised Premises with his permission whether express or implied) so as to be unfit for occupation and use then the rent hereby reserved or a fair proportion thereof according to the nature and extent of the damage sustained shall be suspended until the Demised Premises shall again be rendered fit for habitation and use. If the Demised Premises shall not be rebuilt or reinstated by the Landlord within one (1) month after the event either the Landlord or the Tenant may at any time thereafter give to the other of them notice in writing to determine this tenancy and thereupon this Agreement shall cease and be void as from the date of the occurrence of such damage or destruction but without prejudice to the rights and remedies of either party against the other in respect of any antecedent claim or breach of covenant or of the Landlord in respect of the rent hereby reserved until such date. 6.3.1 Any interruption in any of the common facilities used and enjoyed in conjunction with the Demised Premises occasioned by reason of necessary repair or maintenance of any installations or apparatus or damage thereto or destruction thereof by fire, water, Act of God or cause beyond the control of the Landlord or by reason of mechanical or other defect or breakdown or other inclement conditions or unavoidable shortage of electricity or water telephone service or labour disputes. 6.3.2 Any damage injury or loss arising out of the leakage of the piping, wiring and other systems in the demised premise. 6.3.3 Any damage or loss of the goods and chattels of the Tenant as a result of theft, robbery or any other willful and destructive act committed by outsiders beyond the control of the Landlord. 6.4 In the event the Tenant shall be desirous of taking a tenancy of the Demised Premises for a further term, the Tenant shall give the Landlord Two (2) months’ written notice of the same. Provided always that the terms and conditions of this Agreement shall have been duly observed and performed by the Tenant, the Landlord shall grant the Tenant a further term of tenancy as is specified in Section 11 of the Schedule hereto upon the same terms and conditions (save and except for this clause) and at a rental to be agreed upon. If tenant wants to renew their stay, they should inform the landlord at least 2 months in advance, but the rent may be renegotiated. If the tenant moves out early, the landlord can keep the security deposit. If the landlord ends the tenancy early, landlord must return the security deposit PLUS compensate the tenant an additional two month’s rental. (ii) by paying to the Landlord Two (2) months’ rental in lieu of notice thereof. 6.6. Without prejudice to Clause 6.1, the Tenant shall pay interest on demand to the Landlord on any monies which are or become due and payable pursuant to the provisions of this Agreement or due upon judgment to the Landlord until such time as all outstanding moneys including interest shall have been paid in full. The rate of interest applicable shall be at the rate of ten per centum (10%) per annum and such interest shall accrue and be calculated on a daily basis. 6.7. In the event the Landlord shall be desirous of selling the Demised Premises prior to the expiration or the term hereby created, the Landlord hereby covenants undertakes and agrees that such sale shall be subject to this tenancy and shall procure the Purchaser to continue with the terms and conditions of this Agreement in lieu of the Landlord and the Tenant hereby agrees to allow prospective purchasers at all reasonable times to enter upon and examine the Demised Premises upon reasonable notice given by the Landlord. 6.8. All costs and incidental to the preparation and completion of this Agreement including stamp duty shall be borne by the Tenant and it is further agreed that all costs and disbursements incurred by the Landlord (including the Landlord’s Solicitors’ fees on a Solicitor and Client’s basis) in enforcing his rights hereunder in the event of any breach by the Tenant hereof shall be borne by the Tenant. Likewise, it is also agreed that all costs and disbursements incurred by the Tenant (including the Tenant’s Solicitors’ fees on a Solicitor and Client’s basis) in enforcing his rights hereunder in the event of any breach by the Landlord hereof shall be borne by the Landlord. 6.9 Any notice in writing under the terms and conditions of this Agreement to be sent to either party hereto on the other shall be by prepaid registered post and shall be deemed to be sufficiently served at the time when in the ordinary course of post would have been delivered. 6.10 No relaxation or forbearance delay or indulgence by the Landlord in enforcing any of the terms and conditions of this Agreement nor the granting of any time by the Landlord shall prejudice affect and/or restrict the rights and powers of the Landlord hereunder. 6.11 The Schedule hereto shall be taken read and construed as an essential part of this Agreement. This section aims to clarify some definitions. 7.3 words importing the singular number shall include the plural number and vice versa. This section is for the signatures of both parties, as well as a witness. IN WITNESS WHEREOF the parties hereto have hereunto set their hands the day and year specified in Section 1 of the Schedule hereto. This section provides all the actual information such as address of the property, landlord and tenant contact details, terms of tenancy, etc. The previous parts of the agreement refer to specific sections in this schedule. Two (2) months written notice in advance by either party before the expiry date as per Section 6 above for a further term of One (1) Year and subject to new rent and deposit to be mutually agreed by between the Landlord and the Tenant. The inventory is a list of items in the property that are handed over to the tenant. It is expected that all the items listed will be returned in good working order at the end of the tenancy. The sample tenancy agreement is for informational purposes only and does not constitute any legal advice from us. Get help from a professional (e.g. lawyer or property agent) if unsure! Now that your property is tenanted, what to do if they need maintenance? If you want a hassle-free way of managing rental property maintenance, you can use Recommend.my. Keep your property in top condition without spending all your time managing tenant requests. This article is written for informational purposes only. It does not constitute legal advice. You should always look for professional help before entering into a legally binding agreement. This is awesome. You guys rock! But I couldn’t find Sub Clause 6.5.3. in your sample tenancy agreement. Good article and writing. Keep up the good work. My tenancy period is 1+1 year. Does the tenancy signing needs to have witness? Once the agreement is signed, what is the grace period to get it stamped? This is awesome! Thank you for this, definitely save my time & money. And I especially love the part where you put the jargon words into simple layman terms. Thanks! What if the tenant is allowed to sub-let (carve part of shoplot to others). What proper clause to include in the tenancy agreement to protect both parties? Hi Foong you would need to edit clause 4:14 above to allow subletting. But, I don’t have a sample of that clause. Now that WhatsApp or WeChat have become our daily tool for communication. How can we include such mode of communication into the contract. Also, we can so easily include “Notices” document to the tenant. How do we include such a clause. Are they legally binding if we send document to our tenant using, eg, WhatsApp? From my research, it seems that whatsapp or wechat messages (known as “electronic evidence”) is generally agreed to be legally binding and, while not common, is becoming more acceptable in court as evidence. Having said that, we do not have legal expertise here at Recommend.my, so I do not have any idea how it could be included in the contract to say “any form of electronic message between landlord and tenant is considered legally binding”. Any lawyers here to provide a definitive answer? Hi Alex, I consulted my lawyer friend before and he told me the same. In my previous O&G company, email is admissible in court. In fact, any medium we use to communicate can be binding in court. Hence, we cannot WhatsApp/WeChat/voice call anything we don’t mean to say. So be very careful. I think it is by default binding without being mentioned in the contract. The contract didn’t say that the “only” acceptable form of notice is by letter. However, if we include electronic medium as being acceptable form of communication, then we need to add in another clause to make both parties accountable to inform if there is any change to the number/id.